@RobTrainSystems can you write one with your least favorite cues? Thanks Jared for the great idea! Normally I like to keep my articles positive. Yet in this case, I think examples of what cues NOT to use can be really instructive. At the end of the day, coaching and cuing are the icing on the cake. Think about it: You’ve done everything else right. You’ve assessed this athlete and determined exactly what they need. From there, you wrote the perfect program. It’s custom-tailored to get them moving and feeling great. But if you don’t cement all of this by having them move in an optimal fashion, well, you’re just not going to get everything you want to out of the exercise! Now before I jump into the list, a few quick notes. #1 – I’ve used these cues in the past. Yes, I’m admitting my guilt up front. In fact, you can probably find them in a number of articles that I’ve written over the years. But as I’ve learned more about the human body, I’ve moved away from these cues for a reason. If you want alternatives that help your athletes move in a more efficient manner, then make sure to read My Top 5 Coaching Cues from last week. 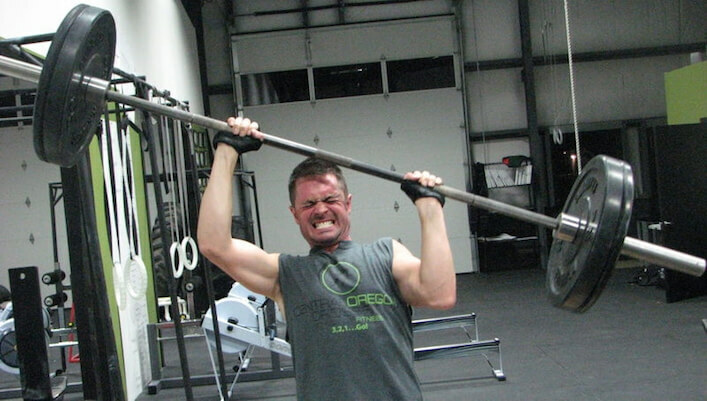 #2 – This isn’t a purely a powerlifting/strength training article. If your only goal is to move ridiculous amounts of weight, then I realize the cues below are probably commonplace in your coaching and training. Like I said, I’ve used them in the past as well. Just know and understand that what helps you move stupid amounts of weight in the gym may not be the best thing for your body from a movement perspective, and that their can/most likely will be consequences for that somewhere down the line. #3 – This is written for “Normal People” and Athletes. I train two types of people these days: Everyday clients/athletes who want to get stronger (for fun), and high-level athletes. For my clients who simply want to get strong, I coach/cue them exactly as I outlined in the above article. Sure, I want them to be strong, but I also want them to stay healthy and lift at a high-level for years to come. I’m more focused on the long-game here than anything else. For my athletes, strength is a tool in the toolbox. Yes, I realize that strength can carry over to power and speed development, but I also think poorly applied strength training can cause athletes to break down early. At the very least, you’re driving home (and loading) ineffective and/or sub-optimal movement patterns. #4 – There are No Bad Cues! In my opinion there are no “bad” cues! In my post last week about squatting, I talked about a certain time and place where I would cue the knees to move forward first. If someone is so patterned and their only option is to sit back, then cuing the knees to move first often fixes the underlying issue and starts to rebuild the motor pattern. But if you have an athlete who only breaks at their knees when squatting, then it’s an absolutely awful cue. The timing of the cue. In fact, every one of the cues below could be use correctly in certain times/cases. However, more times than not, I feel they’re creating dysfunction versus more optimal and efficient movement patterns. So with all that being said, here are my five least favorite cues. I know I’m going to piss some people off with this article, so why not do it right off the bat? 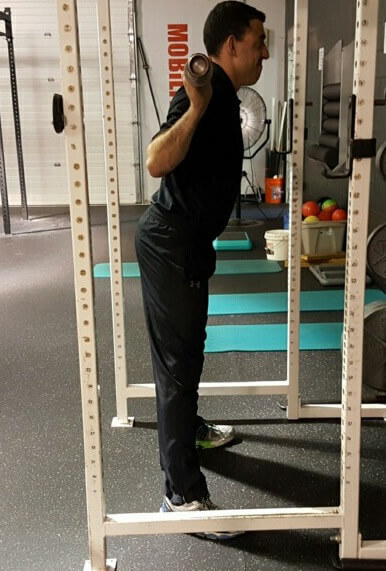 For years we’ve talked about controlling anterior pelvic tilt (APT) and lumbar lordosis (LL). (Going forward I’m just going to refer to these two as APT/LL). APT/LL puts more pressure on the lumbar spine, the intervertebral discs, and the front of the hip joint. Furthermore, it puts our glutes, hamstrings and abs in a disadvantageous position to both control position and produce force. So why, then, when we set up for a big lift do we use a cue that throws us immediately into this sub-optimal posture? When someone is squatting or deadlifting, we absolutely want the chest up and a neutral alignment throughout the spine. But coaching or cuing someone to do arch or “puff their chest out” excessively not only puts them at a disadvantageous position for performance, but it also robs them off their mobility as well. Instead of arching hard or making a big chest, think about staying long or staying tall underneath the bar. Furthermore, another cue that works well when coming out of the bottom is to “lead” with the chest. The cue isn’t to excessively arch out of the bottom, but to simultaneously extend both the hip and knee joints, such that the chest stays up naturally. 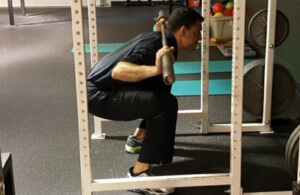 When coaching the squat, we want our athletes to learn how to access and load their posterior chain. (Please read this if you haven’t already: Do Athletes Need More Anterior or Posterior Chain Work?). So if you want to load your posterior chain, it only makes sense to sit waaaaayyyyy back, right? First and foremost, “sit way back” is often combined with “arch hard/chest up.” So you’re lengthening the posterior chain (via APT/LL) and then trying to load it. As the Tweet implies, when you sit way back, that changes everything about the lift. The head comes forward, there’s more bend at the trunk/hips, and yes, it is easier to keep the tibia vertical throughout. For athletes and everyday folks, I want them to load the hip and knee simultaneously. I want them to learn how to use their quads. And quite frankly, I want their squat to look like a squat! If someone has a tendency to be “all knees” when they squat, then absolutely, cue them to sit back initially to smooth out the pattern. Otherwise, teach your clients and athletes to load both the hip and knee joint simultaneously. Not only will this allow them to express their true mobility, but will effectively load all of the muscles around the hip and knee joints as well. Another common cue is to “shove” or “push” the knees out as hard as you possibly can. What it does to the feet. When it comes to the joints and muscles of your body, know and understand that everything happens in three planes of motion. Stand up and try this: Set up like you would on a squat, and then squat down while pushing your knees out as hard as you can. If you’re like 99% of the population, chances are you fall into an APT/LL. When you push the knes out hard, you’re creating frontal/transverse plane motion at the hip joint. The goal is to fire up your glutes in an effort to effectively load your hips when going down, and then to use them to power out of the hole. 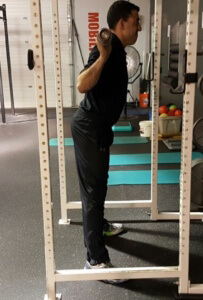 When you shove the knees out hard when squatting, you’re driving frontal/transverse plane torque in a lift that is primarily a sagittal plane movement! While it’s well intentioned, I don’t think you’re getting what you want to out of it. The final nail in the coffin here is when you drive this hard external rotation through the hip, it closes off the back side of the pelvis. But that’s just what it does at the hip, if we work our way down the kinetic chain, pushing the knees out hard loads the thigh musculature in an awkward fashion as well. When you push the knees out excessively, you overload the lateral thigh musculature (think biceps femoris, vastus lateralis, etc.). Even though you may not be trying to, you’re creating a muscle imbalance around the hip and knee joints as a result. Last but not least, when you shove the knees out hard, a common compensation for lack of hip motion is to simply supinate or roll the foot out to the side. For all my clients and athletes, I want them to feel the whole floor. When they can feel the floor, their body is getting solid feedback as to where it is in space, which allows them to move in a more seamless and integrated fashion. Instead of cuing an athlete to push or shove the knees out hard, cue them to subtly push the knees out such that the foot, knee and hip are in a straight line throughout. If the foot-knee-hip alignment is maintained, and they can feel the whole foot, then they can effectively push out of the bottom. Now that we’ve covered some of the biggies on the lower body, let’s discuss the upper body a bit. When performing compound pressing exercises like push-ups or bench presses, a common cue is to “tuck the elbows” as hard as you can. The goal here is to engage the lats as shoulder stabilizers, and while well intentioned, I think if often does more harm than good. This is why I love the thought process of “making the arrow” instead. It still keep the shoulders in a healthy position, but it reduces the role of the lats as spine stabilizers. The next question is what to do on a bench press. 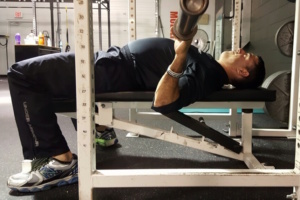 It may surprise you, but I like the arrow cue on a bench press as well. 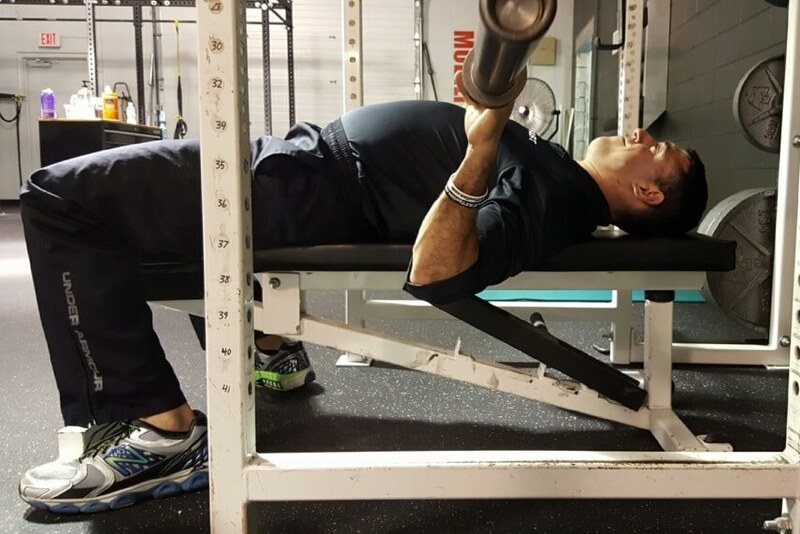 When benching and tucking the elbows very hard, not only does that drive APT/LL, but it also tends to put a lot of stress and strain on the front of the shoulder joint as well. Try this: Wherever you’re sitting puff your chest out and then tuck your elbows hard like you’re bench pressing. Make sure to focus on what happens at your shoulder joint. If you’re like most of us, you don’t have the range of motion to come all the way down to your chest without the front of your shoulder (humeral head) gliding forward a bit. Again, think about making that arrow where the elbows are a 45-degree angle relative to the torso throughout. Your shoulders will thank you! Let’s finish off with a cue that at first glance makes sense, but in actuality, tends to work against us. When performing a push-up we know that we want to finish with a nice clean reach at the start/finish. So it only makes sense that when we initiate the lift, we should think about actively retracting the shoulder blades. Right? When you pull the shoulder blades back first in a push-up, what what should be a blend of scapulo-humeral motion become all scapula, then all humeral, motion. In essence, you slam those scaps back, run out of scapular retraction room, and then are forced to finish with humeral (shoulder) range of motion. We run into the same problem here as we did above, though. We often don’t have adequate range of motion at the shoulder, and to get that full range of motion, that shoulder tends to glide anteriorly out of the socket. They want to move scaps first, so I cue them to bend at the elbows first. It’s one of those counter-intuitive cues, but it works like a charm when the situation dictates it! As I’ve said before, there’s a time and a place for virtually any cue. In fact, I’m always on the lookout for new cues, even if I know they will only be used a fraction of the time. Your job, as a coach, is to have an arsenal of cues at your disposal, so that when the time comes, you can give your athlete the right cue, at the right time. I hope you’ve enjoyed these posts – now get in the gym and coach somebody up! Mike, You’ve really turned me on to ” feeling the whole foot” while lifting. Really like that cue. I haven’t used or heard of point 5 before. To me it seems that motion should happen naturally. Shane – Awesome! I love that cue, and what you’ll find is that it feeds into everything we try and do from not only a lifting perspective, but speed and agility as well. Good luck! I love it man – definitely changes the feeling of virtually any exercise! Andrew – Thanks for the kind words. I’ll do my best to get it out there!